Arizona Governor Doug Ducey directed the Arizona Department of Transportation to suspend Uber’s testing of self-driving cars on Monday, in response to an incident last week in which an autonomous car struck and killed a pedestrian. In Ducey’s letter to Uber CEO Dara Khosrowshahi, the governor called dash footage of the crash “disturbing and alarming” and claimed the event was an “unquestionable failure to comply” with his state’s standards of prioritizing public safety. But emails between Uber and Ducey’s office, obtained by The Guardian, suggest that Ducey wasn’t always so concerned with Uber not prioritizing public safety. Four months later, in December 2016, Uber started testing self-driving cars in San Francisco without trying to obtain the self-driving car permits required in California. When the state revoked registration of the 16 test vehicles, Uber shipped the cars to Arizona. 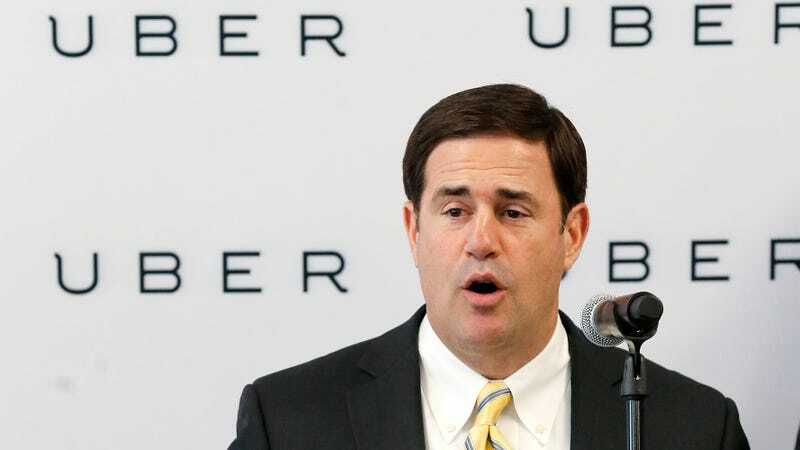 Ducey gleefully announced that “Arizona welcomes Uber self-driving cars with open arms and wide open roads.” As The Guardian notes, Ducey did not mention in that announcement that Uber had already been testing self-driving cars on Arizona roads for several months. As proof, Ptak shared an article from the Arizona Capital Times from August 15th, 2016: “New panel explores rules for driverless cars in Arizona,” which says that “self-driving cars are already being tested on Arizona roads.” Ptak also mentioned an executive order that Ducey signed in the summer of 2015, allowing for the testing and operation of self-driving cars. However, that executive order was included in The Guardian article. Uber did not respond to Gizmodo’s request for comment on whether it actively tried to keep the self-driving car program from the Phoenix public in 2016. The next day, July 12th, Ducey tweeted about Uber Eats, with a link to the website. Ducey has tweeted about Uber about 50 times.